Watermelon (Citrullus lanatus var. lanatus) is a vine-like flowering plant originally from southern Africa. 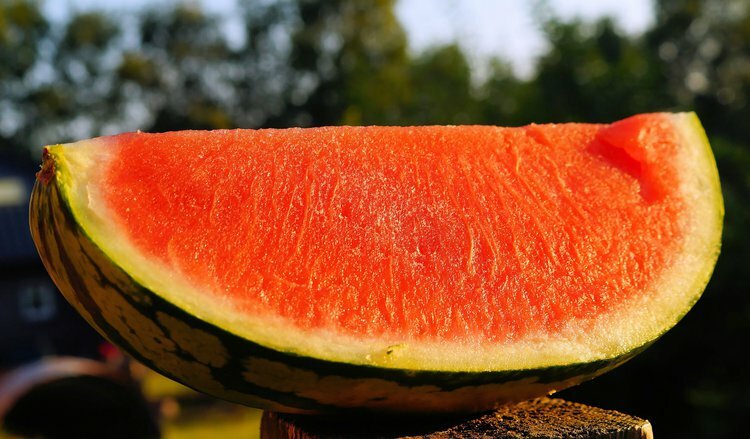 The watermelon fruit has a smooth exterior rind (usually green with dark green stripes or yellow spots) and a juicy, sweet interior flesh (usually deep red to pink, but sometimes orange, yellow, or white). Watermelon (Citrullus lanatus var. lanatus) is a vine-like flowering plant originally from southern Africa. The watermelon fruit has a smooth exterior rind (usually green with dark green stripes or yellow spots) and a juicy, sweet interior flesh, usually deep red to pink, but sometimes orange, yellow, or white. Here are the 7 health benefits of watermelon. 1. Watermelon can help individuals fight infections. One cup of watermelon contains 39 percent of the vitamin C daily requirements. Vitamin C is a potent natural water-soluble antioxidant that helps the body develop resistance to against infectious agents and eliminates cancer-causing free radicals in the body. 2. Watermelon is great for the hair and skin. Adequate vitamin C intake does not only improve the immune system but can also create and maintain collagen, a necessary essential protein found in hair and skin. 3. Watermelon can help individuals sleep better at night. Watermelon has been known to help an individual sleep with its high content of magnesium, which is a mineral that is directly linked to improving the quality, duration, and tranquility of sleep. Watermelon also helps regulate the metabolism, to help reduce sleep disorders and the occurrence of insomnia. 4. Watermelon can contribute to maintaining a healthy blood pressure. Watermelon is loaded with potassium and a low content of sodium. They are well known because of its high potassium content. One cup of mangoes contains 320 milligrams of potassium, compared to 2.9 milligrams of sodium. This helps the blood vessels relax and maintains proper blood pressure. 5. Watermelon can help improve the heart’s health. The recommended 4,700 mg of potassium is not obtained by many individuals in the United States, according to the National Health and Nutrition Examination Survey, despite the benefits of increased potassium intake. One study suggested that people who consumed 4,069 mg of potassium per day had a 49 percent lower risk of death from ischemic heart disease compared with those who consumed less potassium, approximately 1,000 mg per day. 6. Watermelon can help improve kidney health. Watermelons contain much potassium, which is very helpful for cleaning or washing out the toxic depositions in the kidneys. The drupe also helps in reducing the concentration of uric acid in the blood and reducing the chances of kidney damage and the formation of renal calculi in that organ. 7. Watermelon may help reduce the risk of cancer. Watermelon has antioxidants like lycopene that seeks and eliminates free radicals in the cell that turns normal cells into cancerous cells. Lycopene has been shown significantly to reduce the risks of prostate, breast, colon, lung, and endometrial cancer. Ogunbanwo, S. T., Sado, A., Adeniji, O., & Fadahunsi, I. F. (2013). Microbiological and nutritional evaluation of water melon juice (Citrullus lanatus). Academia Arena, 5, 36-41. Gijsbers, L., Mölenberg, F. J. M., Bakker, S. J. L., & Geleijnse, J. M. (2016). Potassium supplementation and heart rate: A meta-analysis of randomized controlled trials. Nutrition, Metabolism and Cardiovascular Diseases, 26(8), 674-682. Graff, R. E., Pettersson, A., Lis, R. T., Ahearn, T. U., Markt, S. C., Wilson, K. M., ... & Loda, M. (2016). Dietary lycopene intake and risk of prostate cancer defined by ERG protein expression. The American journal of clinical nutrition, 103(3), 851-860. Gloria, N. F., Soares, N., Brand, C., Oliveira, F. L., Borojevic, R., & Teodoro, A. J. (2014). Lycopene and beta-carotene induce cell-cycle arrest and apoptosis in human breast cancer cell lines. Anticancer research, 34(3), 1377-1386. Rowles, J. L., Ranard, K. M., Smith, J. W., An, R., & Erdman, J. W. (2017). Increased dietary and circulating lycopene are associated with reduced prostate cancer risk: a systematic review and meta-analysis. Prostate Cancer and Prostatic Diseases. Nielsen, F. H., Johnson, L. K., & Zeng, H. (2010). Magnesium supplementation improves indicators of low magnesium status and inflammatory stress in adults older than 51 years with poor quality sleep. Magnesium Research, 23(4), 158-168.